I have no idea if anyone would find this to be a useful resource, but here's a list of links to all of the episode discussion threads. Do note, in the older threads that were created before the board was switched over to the vBulletin software we use now, in the listing of the poll question, the poll question is sometimes some poll question from some other poll but the polling options still look right for an EpDis thread. Last edited by vacantlook; September 29th 08 at 19:29. Reason: Added more links. But thanks. I missed some of these when they were doing the rounds, now I can catch up. Makes 'em easier to find. Thanks for putting that together. Now. 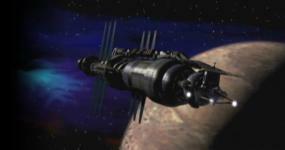 we're going to need a poll for Babylon 5 - The Lost Tales - Voices in the Dark - Over Here and Over There. You should make this a STICKY thread. Otherwise in a few days it will fall off the main page for everyone and be wasted. It's a good index to helpful and interesting threads about each episode...it should be kept at the top of this forum. Problem is that we're getting quite a few sticky threads now, with TLT still being heavily discussed, and too many sticky threads in one forum isn't too nice .. but that should pass in a few weeks. Then, yes. I don't think three sticky threads would be excessive in one forum. Currently only two TLT threads are sticky. Actually, I question the necessity of stickying threads that are so popular they'll stay on the first page all the time anyway. "Summoned, I come. In Valen's name I take the place that has been prepared for me. I am Grey. I stand between the candle and the star. We are Grey. We stand between the darkness and the light." - Delenn in Grey Council: "Babylon Squared"
Well, as that fades many people who haven't had a chance to see TLT yet. I know it's frustrating, since I'm a Dr. Who fan. But they are probably just promoting more continuous talk so that seeing TLT a half year later won't mean you have a thread to read, but the "conversation" is really over by now. So making it sticky to keep people aware of the thread might push more extended talk. From those I've known if this isn't the strategy, usually they go to the other extreme, and suddenly anything that caught anyone's fancy once is sticky, and none of the stand out anymore. B5tv.com is, I think, doing a very good job at finding an approach that is somewhere in the middle. Sticky the Vegas get-together thread, and also sticky the most-recent B5-related project since that's kind of your board's main theme. I admit, I like this more middle-of-the-road approach. So far no one has just decided that all the threads should be sticky. Obviously sticky threads no longer serve their purpose if too many threads are sticky. However, I do think that this index could be a good way for people new to the show to discover the episode discussions again. It wouldn't surprise me to find a lot of people who were too young (or too busy) to watch B5 ten years ago getting into it now that TLT is out. That made me do a double take as I am reading and answering your post on my laptop screen of 14"